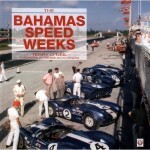 Cord Complete is simply the most appropriate title possible for this book for a myriad of reasons. Comprehensiveness is just one of those reasons. Given Cord’s place in today’s auto-collecting firmament and the distance in years from its origins, it is sometimes difficult to recall clearly the circumstances surrounding its beginnings. 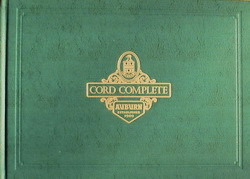 Cord Complete completely captures and presents it all, clearly and in a most readable fashion—both the “bigger picture” (what was going on in the surrounding world) and the “inside story” of design, development, marketing, the internal power struggles, as well as the struggles with the cars themselves. Included are original factory sketches, engineering drawings and more—much previously available only to cognoscenti. 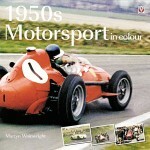 As mentioned at the outset the “completeness” of this book extends beyond the comprehensive recounting of things of history; beyond even the newly found and published images of Ab Jenkins running the Cords (yes, plural—read the book, you’ll understand) at the Indianapolis Speedway in 1937.Complete extends to the inclusion of a chapter covering other later-produced vehicles whose design and existence were inspired by the Cord; another chapter on individuals particularly significant in preserving Cord lore as well as cars; another on miniature Cords (models in other words); another on Cord owners of particular fame ranging from Amelia Earhart to Jay Leno; and more. The more includes photos of Cords restored to their original glory intermingled with artwork featuring the Cord from a litany of skilled and inspired artists including Ken Eberts, Tom Hale, John Francis Marsh and others. There’s a segment focusing on factory literature and advertising while other examples of these are also included, where appropriate, to illustrate the text. And there are the tables of statistics, production data, weights and measures, etc. with the requisite index bringing the book to a very complete and appropriate close. One final note regarding the page layout and overall presentation of material: it is, in opinion of this reviewer, particularly pleasing. Sidebars offer material and images that enhance the main text. And footnotes are usefully placed on each page-pair wherever applicable thus saving the reader from having to flip to a section at the rear of the book, thence back to the main text. A few more words seem in order in regard to the design and presentation of this remarkable book, a reader’s appreciation of which would only be enhanced by knowing a bit more. The author—actually, let’s call him “Josh” since he himself dislikes being referred to as a distant, ivory tower-ensconced Grey Eminence—and his principal artistic collaborator, friend, fellow Cord owner, and Art Center College of Design alumnus Robert Pease deliberately strove to create a book whose execution and artistic merits would be a credit to the artistry embodied by the object of their affection, the Cord automobile. Nothing in or about this generously sized 14″-wide book is random—but not everything is self-evident or even explained. 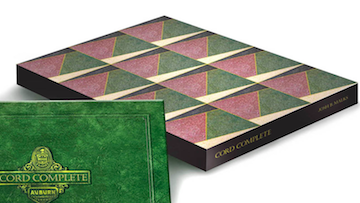 There’s the terrazzo-patterned paper on the slipcase emulating Auburn’s 1930s showroom floor and the green leather cover boards that are dyed to resemble the actual interior of a car trimmed in green. While the purple endpapers were chosen just because they looked good and not because they have a corollary in Cord history, the coat of arms is the real thing but the motto is not; it is merely an interpretation of the heraldic symbols (helmet, arrows, hearts) in the emblem. Graphic designer William Evans (an aspiring Cord owner) is to be commended for his restrained but purposeful choices of typefaces, colors, and ornamentation that, combined, are in harmony with the subject matter and serve to subliminally make the whole greater than the sum of its parts. Attention to detail and a sure hand are evident everywhere. The very passage of time that degraded the quality of many of the original materials has also seen the emergence of imaging and reproduction technologies that now permits their restoration, and the importance of seeing here new material added to the historic record cannot be overstated. Incidentally, among the bounty of illustrations are several reproductions of fine art. 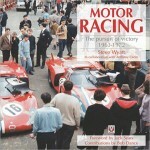 Unhurried perusal will yield unexpected discoveries; look for a surprise on p. 87. Also know that this book is limited to a one-time edition of 1500 of which at the time of this writing less than 500 remain. A book signed by the author is always more collectible and Josh has signed many books at car events and museums, and for friends. 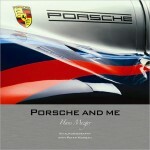 As of May 26, 2010 copies purchased at the publisher’s website will each be signed by him. Josh’s eye first fell on a Cord at the impressionable age of 11 and after finally being able to buy one seven years later he has owned Cords ever since and taken them all over the country and the globe. It is humbling to enthusiasts of any stripe to realize to what lengths he has gone to advance the body of knowledge about “his” marque no matter the imposition on family and professional life such dedication entails. “Cord” should be his middle name, especially since his middle initial “B” is just that and doesn’t stand for anything. Books like this make no one rich (except, possibly, the resale speculator later), so, do the right thing and support the cause of scholarship and good bookmaking by buying one! THANKS FOR A GREAT REVIEW, ADDENDUM REMARKS/OBSERVATIONS FROM HELEN AND SABU AND, MOST IMPORTANTLY, TO JOSH MALKS FOR A SUPERB SECOND ACT IN THE RECOUNTING AND PRESERVATION OF THE HISTORY OF THAT REMARKABLE MARQUE, CORD MODELS 810/812.